John Pearson, “The Burroughs Affair,” excepted from The Sunday Times Colour Section, 3 February 1963. Photograph by Bob Willoughby. 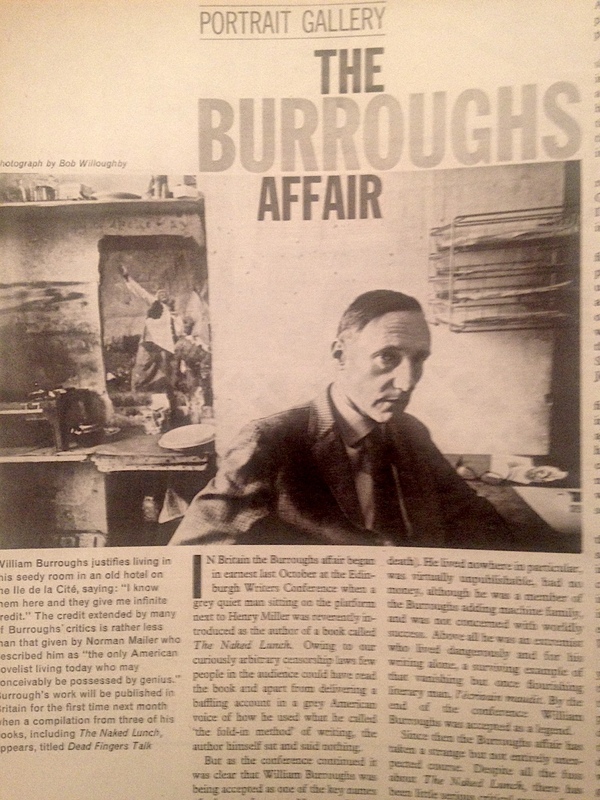 In Britain the Burroughs affair began in earnest last October at the Edinburgh Writers’ Conference when a grey quiet man sitting on the platform next to Henry Miller was reverently introduced as the author of a book called The Naked Lunch. Owing to our curiously arbitrary censorship laws few people in the audience could have read the book and apart from delivering a baffling account in a grey American voice of how he used what he called “the fold-in method” of writing, the author himself sat and said nothing. But as the conference continued it was clear that William Burroughs was being accepted as one of the key names of the conference. Norman Mailer referred to a remark he had made earlier about William Burroughs, the author of The Naked Lunch, being “the only American novelist living today who may conceivably be possessed by genius,” and there was something about the way Mailer said it and something about the way Burroughs looked when he said it that carried conviction. Unlike the rest of the writers present he strangely fitted in with the romantic idea of what a writer should be like. Palpably he was a man who suffered (he had been off heroin for nearly four years by then, but he still looked like death). He lived nowhere in particular, was virtually unpublishable, had no money, although he was a member of the Burroughs adding machine family, and was not concerned with worldly success. Above all he was an extremist who lived dangerously and for his writing alone, a surviving example of that vanishing but once flourishing literary man, l’écrivain maudit. William Burroughs was accepted as a legend. 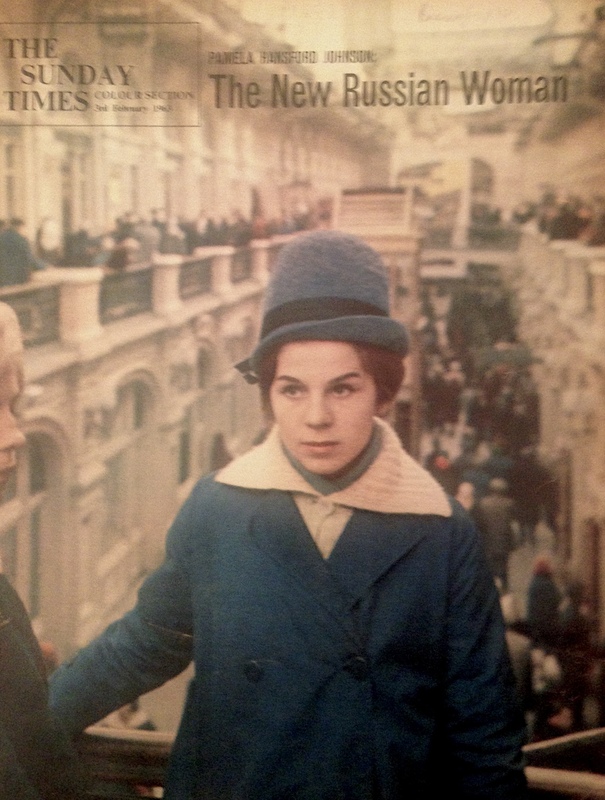 Since then the Burroughs affair has taken a strange but not entirely unexpected course. Despite all the fuss about The Naked Lunch, there has been little serious critical concern for a book that Mary McCarthy and Jack Kerouac, as well as Norman Mailer have hailed as a 20th-century masterpiece. Amongst most people who have read it the reaction is much the same. They seem afraid on the one hand of being though old-fashioned and on the other of having their legs pulled very hard. For The Naked Lunch is a literary curiosity in almost every sense. It is a highly personal fantasy of the nightmare of drug addiction written by someone who has just emerged from it; it is an anarchical and obsessive book about drug taking and homosexuality. At times it is very funny, at times a stylistic tour de force. At others, it is like Finnegan’s Wake put through a mincing machine. Few people who start it seem to finish it. Burroughs himself is inevitably slightly disappointing, a courteous, immensely serious man, who writes for a steady eight hours a day in an old hotel behind Notre-Dame. He has a tiny room with an iron bedstead and a tiled floor. A pair of socks hangs drying from a piece of string. He works painstakingly, writing his first draft on a typewriter, reading it into a tape recorder and then correcting again and again until he is satisfied. As he describes his “fold-in” method of composition, he makes it sound far more deliberate than haphazard “action writing” in which lines of Shakespeare sonnets are scattered into the narrative. 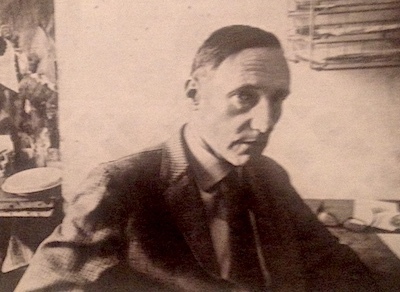 Paradoxically, William Burroughs sees himself primarily as a moralist and social satirist. “My criticism of most institutions is not that they’re evil, but that they simply don’t work. The people in control are making the earth unliveable in. As Inspector J. Lee says in my novel, Novia Express: “in all my experience as a police officer, I have never seen such total fear and degradation on any other planet. Reproduced by Jed Birmingham and published by RealityStudio on 8 January 2017. This is interesting. Thanks for taking the time to share it. 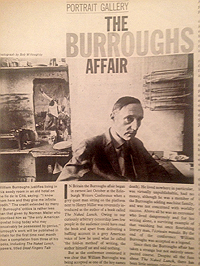 That photo of Burroughs is quite haunting.